Col. John W. Gilliam, married Mary Elizabeth Coleman Goodwyn who had inherited the original Coleman house, Burnt Quarter, from her parents (Mary Coleman and Joseph Goodwyn), around 1840. Col. Gilliam lived at Burnt Quarter until his death in 1853. Burnt Quarter, the oldest Coleman house in Dinwiddie, is located on Five Forks Battlefield five miles down the road from our property…. The Library of Virginia has copies of the architectural plans for the house drawn up by Robert Coleman in 1737. I haven’t made it down to the library yet to get copies, but will add them here once I make it down there. this inscription is scratched into the concrete that surrounds the dam’s sluice gate, next to the mill. 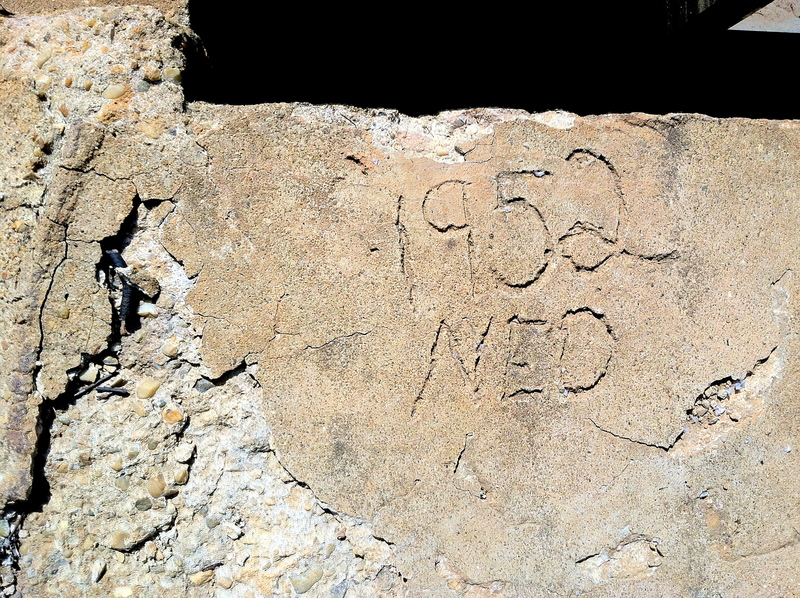 1952 is the last year that the mill was used…Ned would have been around 10 years old at the time. I’m still working on the connection between this family and the Coleman’s of Burnt Quarter and will post it here as soon as I have more definitive proof. Hey! I’m a Coleman from the Choctaw County Mississippi line. I was reading our family history and researching the Burnt Quarter and came across your blog. Maybe that can help make the connection between your family and the Coleman’s there? Hi Chris, thanks for checking out our blog…it’s great to have an actual Coleman checking us out! I’ve done a little more research on the Coleman lines since I started this…The Burnt Quarter Coleman line seems to have started with Robert Coleman Sr., who settled in the Prince George/Dinwiddie VA area in the 1600s. I believe he is either a brother or cousin to William Coleman Sr., who ended up in the same area and whose descendants ended up at Colemans Lake. The family trees I’ve put up on ancestry.com are educated guesses…I’ve used as many records as I can find to come up with what seems the most likely relationships and am fairly confident that they are correct, but can’t guarantee it. Where I’m stumped is, who exactly was Mary Coleman’s father (of Burnt Quarter)? I’ve found a couple records saying that her parents were a Robert and Lititia Coleman, while others state that she inherited Burnt Quarter from her father, John Scott Coleman. The latter seems most reliable I think. Clearly she is a descent of the original Robert Coleman who built Burnt Quarter, but there are still a few missing pieces to that puzzle! Here is what I can offer reflected by actual records. My Virginia to Eastern Tennessee circa 1830’s. We know that my John Coleman born 1815/19 came from the Halifax, Va. area and wed the daughter of Thomas Walker,Jr. May Ann Walker born 1821, Halifax Co., Va. The couple were married in Knox Co., Tn. in 1846. John Coleman’s father believed to be William Coleman listed in the 1820 Land Owners census in Meadville, Halifax, Va. The 1850 Knox census shows then together next to Tom Walker born 1795, Va. Tom Walker.Jr. married Anna Wade born 1801 in North Carolina prior to relocation to Knox Co. The Walker’s go back to Northumberland, Va. Tom Walker,Sr. 1762 wed Sarah Coleman, 1775 in Va. as well. This Walker line is in the group #61 of the DNA listings. My DNA suggests connection to the Robert Coleman born 1622, England. This line is referred to as the “Mobjack Bay” Gloucester, Va. line. My own DNA tells me that I am Scot-Irish in heritage. Much info is available on the web pertaining to the Mobjack Bay lineage. Hi, Another Coleman checking in. I’m a descendant of Robert Coleman from the Mobjack Bay area. Hey Mike, thanks for checking in! I came across many records pertaining to Robert Coleman of Mobjack Bay when I was doing my research on the Virginia Colemans. There’s been alot of confusion between the lines of Robert Coleman of Charles City County (later Prince George Co.) and the lines of Robert of Mobjack bay! Do any of you know of Kadar Coleman, son of one of the Roberts(Nasemond, I think). Had a son Charles,etc…They went from Naasemond Co, Virginia to Edgecombe, NC to Fairfield Co.,SC. I would appreciate any details you may have. My mother was a Coleman. Though this is a different branch of Robert Colemans than those around Colemans Lake, I did go onto ancestry.com to see what I could find. (If you don’t have an account on ancestry.com, if you’re interested in genealogy research it’s well worth checking out!) Kadar Coleman does show up in the North Carolina marriage records, having married Susannah Stephenson in Edgecomb County, NC on April 5, 1764. He presumably was born in Nansemond, Va in 1734. Parents are listed as Robert Coleman III of Nansemond County VA (b.1705-d.1761) and Susanor Coleman (b.1711 Nansemond, Va). Robert Coleman III’s parent are Robert Coleman II (b. 1676- d.1761)and Susanna Coleman (b. 1679). Not sure if that helps any. If you can get your hands on a copy of J P Coleman’s book, The Robert Coleman Family from Va to Tx, 1652-1965, he might have some useful information as well. Actually, I think you can get alot of his book online if you Google it. Thank you very much for your help!! You may have run across my Ancestry, but I think that the Robert is incorrect!!! Will go back and look some more. Wes Coleman also wrote a Coleman book, but I see differences in the two books. Will say, they have done more than anyone, and I have used their work and appreciate it. Just always looking for an accurate answer! It wouldn’t surprise me if the family trees I quoted had mixed up the Roberts. I know when I was doing my own research last year that I found many people mixing up the various different Robert Colemans. I guess not realizing how far apart the various different Virginia counties are.? I think there are a lot of people that just copy and paste info onto their family trees without first checking for sources. (Which of course is what I did when doing the quick search for the above info.) I tried to find land records, wills and census records to back up my findings before placing names on my own trees. Unfortunately, in the case of the Dinwiddie and Amelia County Colemans, a lot of the records were lost…I think burned at some point. Thank you very much for your quick response…still searching! Do you share your Ancestry tree? Hi I am the Grandson of Louis G. Coleman (better known as Shake) brother of Edward (Buster) Coleman of Coleman lake. My Uncle Knoxfield Coleman still resides in Dinwiddie and I along with my brother still hunt on the old Coleman farm in Ford, Va. Have been diligently searching for my grandfathers history. Glad to come across this page. Roger, thanks so much for checking out our blog! I can’t tell you how excited I am to hear from a member of the Coleman Lake family! I spent so many hours researching your family’s history when we first bought our property, that I feel much the same as if I’d just heard from a character out of an historical novel I’d just read! Hi Roger I know it has been a while but here is what I have on you line. I am almost certain Furneau is the son of Jess Coleman all of the evidence so far points in that direction. I also think that Furneau is the brother of Armistead Coleman who was the administrator of Daniel Coleman (my line) who’s youngest brother was Jesse Coleman. Armistead and Furneau lived next to Daniel’s plantation and after he died they lived by Daniel’s daughter in law Margaret Quarels Coleman. Hi, Is there a listing or record of the slaves that were on Burnt Quarter Plantation through the Civil War? I’ve not come across such records but that’s not to say they don’t exist. Seeking data on the William Coleman family living in Meadsville, Halifax Co.,Va. Circa 1820 with possible son John born 1815/19,Va. John believed to have relocated with other Halifax families, Walker, Wade, Simpson and Wright to South Knox Co.,Tn. William born between 1775 and 1795, Virginia. John b-1815 married Mary Ann Walker also born Halifax,Va. in 1821. These combined families can be seen in the 1830 Knox Co.,Tn. census records living in district 15. I believe I am a descendant of this line of Colemans. My great-great grandfather was Edward Chapman Coleman (1828-1891). Has anyone heard of him? We have Colemans from Mobjack Bay, Nansemond County, Charles City County, Ireland, Germany… We need more testers and Coleman researchers. We have been making big strides in clearing a lot of confusion. PLEASE JOIN, the answers lay in DNA. So good to know that you are taking this further…differentiating between the Coleman lines! I must find my kit number before I can even register, but please keep me on your email list! I did have my DNA done several years ago, and I have a male cousin who did it too! Thank you! Ran across this blog. My ggg grandfather had a brother named Robert Coleman. We believe Coleman was his mother or grandmothers maiden name. His mother was Nancy Stubblefield with “unknown” Stubblefield as husband. We have been trying to trace the “unknown” for years. We cant even find Nancy’s maiden name. Many list it as “Clorance/Clorence” of South Carolina 1800. There are no familiys with that last name at that time. Would be awesome if we could connect the dots through the Colemans! Hi; I need to find all my papers but we have Coleman family connections. They may be related to the Coleman Plantation family. One of my distant grandmothers was Susan or Susannah Coleman from Mississippi. She married a Thomas (Thoma). Her Daughter born Coleman married a Thomas (Thoma) no one knows if the Thomas’ are blood connected. We had family all over VA that later we end up in TX. Also I noticed a John Scott Coleman in this site. My Great Grandfather was Walter Scott Jones born 1857 at Caroline Co VA possible Locust Grove VA area. One of his brothers is John Coleman Jones born Caroline Co VA They later lived at Burleson CO TX. Their parents were William I Jones and Sarah Wharton family was suppose to be connected to Jamestown VA? and all family surnames toe into royalty. My mother Gloria Hortense Thomas (Thoma) Davis her Dad was Henry Eric Thomas (Thoma) he’s descended from Susan Thomas Coleman and her daughter married J C Thomas of Mississippi?? we think John Curtis Coleman or James need to find papers. He’s buried in Burleson co TX. A cousin Larry Thomas did a DNA test and it shows were really Thoma and somewhere along the road it was changed adding a s by mistake. Their connected to an Albrecht Thoma and the family ends up in Germaine VA. I really believe we are connected. Some of the other family names are Magdalene Demourville who marries Jeremiah Rust and later Dr Dominick Jackson. Magdalene Rust dau Hannah Rust marries Thomas Bogge ss and their dau Magdalen Bogge ss marries Christopher Maccabeus Jackson son of Magdalene and Dr Christopher Jackson. A second Christopher Maccabeus Jackson marries Catherine Rhoads daub of Henry Rhoads. Some travel to TX with the Broaddus Family. Hello. I’m looking for information on the “Coleman family cemetary, where I believe my multiple great grandfather, Thomas Coleman Rea was buried. Find a grave says it is in Prince Edward County, however, I’m not sure if that is the current county or before reorganization. He died in 1718. Any insight will be greatly appreciated. How and when did the Coleman and Stubblefield families interact? Hi, Im looking for my grandmothers family, her name was Ella Coleman and she had a sister, Ethel, who married Dilworth Cook of Norfolk VA,, any relation? Sorry, but I cannot help you there. AS Clint said above, we need male Colemans to do their DNA testing. Are any of you aware of any Coleman – Stubblefield marriages? We have the name Robert Coleman Stubblefield in our line and believe Coleman was a maiden name. Help! Perhaps someone else could help. I’ve not seen that name in my line of Colemans. Tammie, I just came upon this while trying to figure out my dad’s paternal line. His aut DNA matches Stubblefield gedcom, he was born 1927 in LA. Do you have DNA in Gedmatch? Sorry Tammie, Not to my knowledge. My line came from Halifax Co., Va. to Knox Co., Tn. Still seeking data on my John Coleman born 1815/19, probably Halifax, Va. Additional Knox Co., Tennessee names connected to my line. Walker, Wade, Giffin, DeArmond, Ford, Hines, Wright, circa 1840/50. The photo above “Ned” is my grandfathers brother, Ned Wilson Coleman. My grandfathers name was Joe Wyatt Coleman and their dad was Wilson Wyatt Coleman. I would love any information or photos you could send. I am still hoping for information on the enslaved people on the plantation at the end of the war. My great grandfather was born and grew up there. Has anyone seen or know of any listing of enslaved people at Burnt Quarter at the end of the war or years prior to end. Plantation property records, records of slave births, wills with property listed, etc. My great granddad Page was born there in the 1850’s. His mother was named Eliza. Hi, I am from Cedartown, GA and my 2nd Great Grandfather was Merrick Coleman born in 1834, and I’m pretty sure his father was Ephraim (Ephrim, Ephram), that was born in South Carolina about 1806. Lived in Franklin county, GA, Bartow county GA, and Cherokee county, Alabama. But all I can find on his early life is a property tax where a Richard Coleman paid on his behalf in 1822 in Franklin county. Richard also paid on behalf of a John and Abner Coleman the previous couple of years. I’m trying to find the link and finish my genealogy. I will be doing a DNA within the next month, but wanted to see if you, or someone on here, can help me out. No one in my family have ever heard of Ephraim, but I’m confident he is my 3rd great grandfather. He only lived about 30 miles from Cedartown. Please purchase the Y-DNA37 or higher, since the 12 and 25 are too poor of quality to be reliable.Thanks for your consideration. I wish I had known about the familytree dna a few weeks ago. I already did the ancestry dna and waiting for results. I’m on a fixed income, so it may be awhile before I get another chance. Hello! Has anyone come across a Jones Coleman in their research? – (born in 1804 in Virginia, according to census records from Limestone, AL.) I am trying to make a connection to any Coleman line from Virginia. Any help would be appreciated. He was married to Elizabeth Long -1st wife, and to Martha Ferguson -2nd wife. He is my g-g-g-grandfather and I do not know who his father is. Clint, That does seem like something I want to do. Do you know the cost of the test? Also, would it tell me exactly which family line I belong to, out of the 5-10 possible lines? Would it tell me if I belonged to the Mobjack Bay Colemans for instance, or the Charles City line? The y-37 kit Just went on sale today thru 18 Jun for Father’s Day. The sale price is $139. There are no garuntee about which family you will be in, or if you will have any matches, but it is likely. The Charles City like has about 20 members, the Nansemond line has 18 (including me)… if you are of a current family, you will be matched together. Then you can work together and hopefully break through the paper trail brick wall. If you are a close match with other Coleman men then you are related. I am the admin of the group so if you test, I will help you with understanding your results. Just open up http://www.familytreedna.com and search for the Coleman Surname Project. Join the project by ordering a y-37 kit or higher (the more markers the better picture we have of your family genetics like Megapixels on a camera). I am managing a multiple line DNA match database of this line and the Jones Coleman line is in this database several times but not yet in the tree line. One of the matches leads back to Coleman Shelton of Giles County TN who died in Limestone County Alabama. He is the grandson of Ann Coleman the dt of Daniel Coleman (this is my line) of Amelia Co., VA. I would look there first. Here are 2 links to my tree you will find hundreds of CCCVA Coleman’s. Hi, I have been researching the Coleman line for about 10 years. My brother had familytree DNA testing done but he only did Y12 which they do not offer any more but it did put our family line to Robert of Mobjack Bay.We plan to up grade waiting on a sale. My Father was born in Coleman Falls VA this family of Colemans eventually moved to White Sulfur Springs, WV. The line goes back to Amherst county to Lindsey Preston Coleman 1814-1894. This is where records are sketchy. I have been trying to find the father of my Great grand father James Matthew Coleman 1871 – 1929 I have a marriage record of him and his wife Lillie Bell Ramsey with only initials of the parents L Coleman and S Coleman . On his death certificate mother was Susan and father has a big blot of ink grrr. Are there any Coleman from Amherst county starting from 1810 or there about? Hey Kathy, do you happen to know what kit number your brothers accout is? Since I last posted, our Coleman members has grown to over 250. We have 21 male descendants of Robert Coleman of Charles City County, VA; 20 male descendants of Robert Coleman of Nansemond County, VA; but only a couple men claiming to be descendants of Tobert Coleman of Mobjack Bay, VA.
We need more Coleman men to test their y-DNA to help narrow it down to the correct family. Please read my previous posts to understand more about who we are and what we are doing. We test y-DNA (passed from father to son like the Surname Coleman) to clear all confusion about which family group you are in. We have over 35 unique Coleman families from around the world. Test yourself, your brother, father, cousin and so on if they are a male Coleman. You don’t need to test multiple people in your immediate family. Only 1 test is needed to clear up the confusion. My g-g-g grandfather was Jones Coleman from Virginia (according to census records) he was a school master and “Justice of the Peace” in Limestone, Alabama. I would like to take the DNA test asap. My name is Jobe M. Coleman. Can you please tell me again how to become part of your DNA Coleman project and complete the testing? Do I still go through FamiytreeDna.com and take the y-37 test? Hi Clint, I just ordered the y-37 test from FamilyTreeDNA! It should arrive at my house soon. I am excited to see what line I am actually from. Who Knows, maybe we are cousins…. There is a Robert Coleman Stubblefield in my line. I know we HAVE to be related to the colemans.